Enjoy the beautiful and tranquil surroundings of the New Forest. April Cottage is a comfortable cosy two bedroomed terrace cottage, set in the middle of the delightful village of Everton with our friendly local shop and pub offering scrumptious local produce. Nestled in the heart of the New Forest, with only a short drive to the beaches, open forest and the charming market town of Lymington with it’s picturesque town quay, boutique shops and bustling Saturday market. The cottage has a sitting/dining room with a separate kitchen, conservatory and boot room. Upstairs there are two bedrooms (one double and one twin) with a shower room. There is a walled garden at the rear and a front garden with gravel parking for 2 cars. Milford On Sea and Keyhaven is 'just down the road'; offering village shops, beaches, cafe's, pubs and restaurants. By taking a short walk/drive to Keyhaven, you will find a traditional pub and a beautiful walk along the sea wall, enjoying the spectacular views of the Solent, the Needles and Isle of Wight. Bird watchers will particularly enjoy the salt pans and marshes that are renowned for their bird-life. You can take a ferry from Keyhaven harbour to Hurst Castle and if you are feeling energetic you can walk back along shingle bank. In the other direction is Christchurch and Bournemouth with long golden sandy beaches, theatres, pubs, restaurants and a buzzing nightlife. We fell in love with the New Forest when we used to bring the children here for beach and forest holidays. We moved here ten years ago and live only a few miles from Everton. We love the lifestyle being near the coast and New Forest - we enjoy sailing and all things boats as well as long walks with our dogs on the forest. We bought April Cottage in 2016 and spent the early part of 2017 renovating the cottage. Everton is an extremely friendly village with lovely local facilities. We loved this cottage because of its beautiful rooms and private walled garden to the rear that leads out on to a lovely lane with a short walk to the local pub for a lunch or evening meal. The village is incredibly well positioned for access to both the coast and forest. We provide some basic provisions for your arrival. The garden has a beautiful display of bluebells in the spring. Towels and linen are included and changed weekly if required. The cottage has a bistro table and chairs for enjoying those warm summer evenings al fresco. We enjoyed our stay, and wish we had made it longer! The only'down side' were the armchairs, low and not very comfortable (we thought! ), and lack of surfaces to put items on when we were seated! April Cottage is a lovely little find .The finishes and little touches are first class .Quaint but spacious cozy lounge and dining area large downstairs toilet. Well equipped kitchen .Light airy conservatory and Great size garden with access to a back rd that leads to a pub . We had a very enjoyable weekend break. The cottage was warm, cosy and had absolutely everything we needed. It was well positioned for visiting both the forest and the sea....which we did. We also had a meal at the local pub, which was amazing. Can’t think of anything that would have made our stay any better. Lovely base to explore the surrounding villages and towns with local amenities close by. Would definitely recommend and return. We enjoyed our 4 day break in this cottage very much! Very clean and well appointed with a lovely welcome food basket. 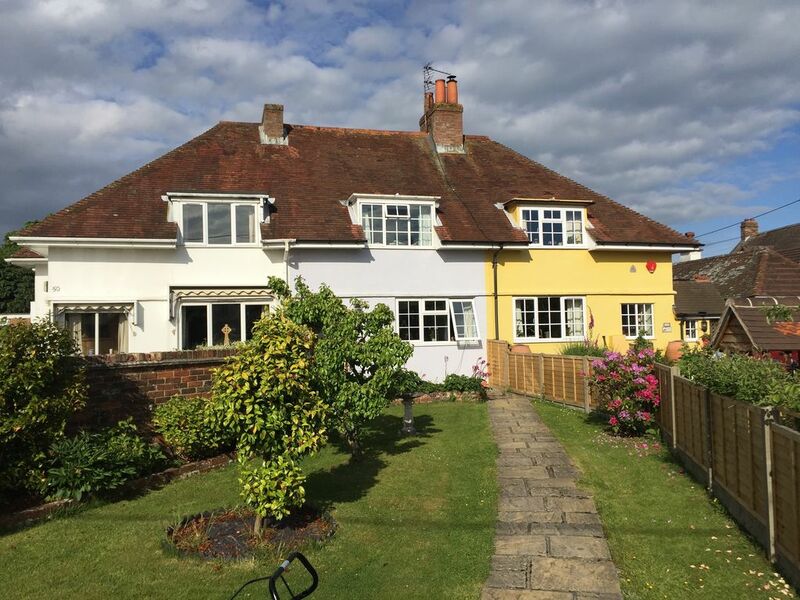 Comfortable beds and a lovely private garden .All set in a peaceful village with a great local shop and post office, excellent pub and very friendly locals! Highly recommend! Best cottage to stay in if you want to explore the New Forest! Very clean, tidy and homely. Great location with lots of amenities close by. Will definitely be coming back in the future.